Have you ever used this awesome tool called Yoast? 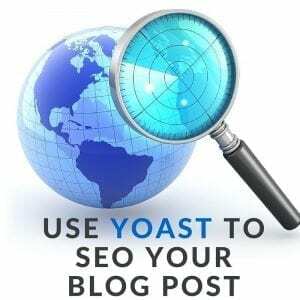 Yoast is a great way to SEO your blog. SEO or Search Engine Optimization is a topic that that seems to intimidate many entrepreneurs, but there are some terrific tools that will help you make sure you got all the SEO juice working in your favor. My favorite all time SEO tool is called Yoast. Basically you enter your keyword in the focus keyword field and Yoast will tell you what is missing and what you have to do. There is a cool button that turns from red, to orange, to yellow to green as you make your blog post better and better. This one is better seen in action than talked about, so I made a video showing it in action. Yoast is free and easily installed on your WordPress website. SEO stands for Search Engine Optimization and the Yoast tool will help you incorporate keywords and phrases so that your community can find your website. Yoast is actually a free WordPress plugin that you can install easily and start using almost immediately. For our example I’m going to show you how I used it to help me promote this blogpost called Create a Facebook Image with a Thanksgiving Message. Here’s the back end of that post. I have written my title, and I have written my blog and put my pictures in and embedded my video. I used Yoast here and I put in my key phrase. It checked my entire blog article to make sure I have that keyword in the appropriate spots and that I was using it the way that it should be used. This area lists out the basics, but you can also look at this page analysis and it will give you more information of what you did right and some things that it may suggest to get you even more traction. What’s really neat about Yoast is that it gives you this little green mark to tell that “Yep! You’re doing a good job”. So the result is when someone uses the keyword or key phrase in google, Creating a Thanksgiving Facebook Image, my blog post shows up almost at the top, which is great. Alright, I hope that was helpful for you. My name is Rebecca Metz with Web Pages That Sell and we were using the SEO tool called Yoast. Check out @yoast – an easy tool to make SEO for your blogs rock!